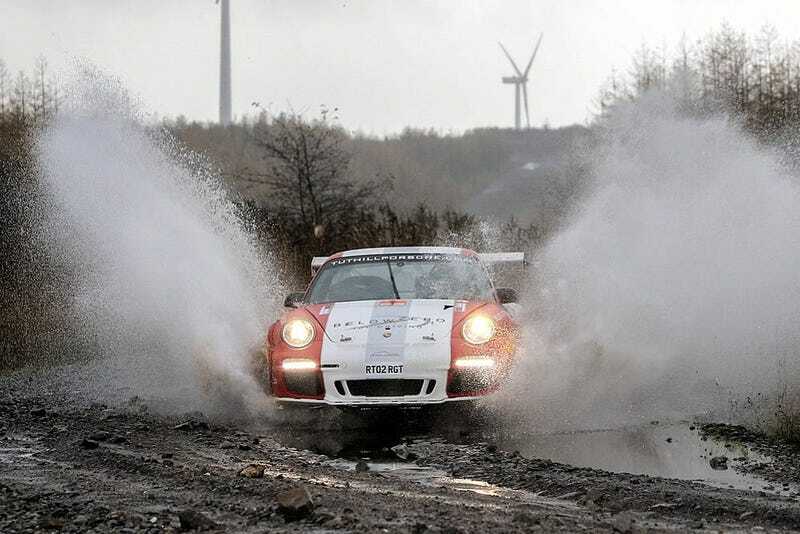 Whenever a Porsche 911 made it to a rally event this year, the crowds rejoiced. An iconic sportscar, getting dirty, and sideways, and airborne, and everything that makes WRC so incredible. And it also happens to sound quite good. Romain Dumas, Porsche factory LMP1 driver, even managed to get a fifth-place finish in the prestigious Tour de Corse, beating some 4WD R5, S2000 and RRC cars, a promising display of pace ahead of next seasons promising R-GT Cup. But of course, the FIA still is the FIA, and they just announced that no, Mr. Tuthill, who pushed the great idea of a 911 GT3 in WRC racing in the first place, can absolutely not start in the upcoming Rally Wales. As you can see from that awesome title picture, Rally Wales is a proper mudbath. Paying tribute to the conditions and being a proper British pioneer, Tuthill modified his 911's suspension (the wishbones) to accommodate fifteen inch mud/gravel tires, and because you just can't simply buy a rally spec car from the Porsche factory, he scrambled it together using stock parts. It all went down well in testing, but didn't go down well with a FIA technician who then denied the car starting permission, for reasons only he can understand. The worst part? According to Mr. Tuthill, he declared the modification in April, but received the denial only shortly before the start of the event this weekend. Even worse? We will not see more pictures and videos of his car doing great, great rally things. Boo FIA, boo.